We are well aware that our individual reputations are built on honesty, integrity and reliability because we are consistently reminded of the fact by our clients and so, from this winning combination of like minds, was born Maria B. Evans Estate Agents. Introducing the right applicant to the right property is a given thanks to our traditional and responsive approach running smoothly beside the more contemporary marketing tools available to us. These include direct and immediate contact with our extensive mailing list, related service links to this bespoke website, several major property websites including www.rightmove.co.uk, www.zoopla.co.uk, national relocation contacts and both county and local magazine advertising including Lancashire Life and The Lancashire Magazine .Our industry expertise with rural property and a passion for excellent service continues to provide all our clients with the most professional advice along with a dedicated attention to detail which has been crafted over thirty six years of combined experience in the sales and rental property market. Lancashire is a county with an eclectic mix of landscapes ranging from beautiful undulating countryside, archetypal river-sliced mill towns, historic woodlands, wetlands brimming with wildfowl and miles of fascinating coastline. All of this is within easy access to three major Northern cities – Manchester, Liverpool and Preston – either via the scenic route or the intertwined motorway network; you choose the pace of life. Whether your vision is to reside in a small and tranquil hamlet surrounded by rural aspects, a traditional market town with hints of a bygone age or within a lively village oozing community spirit, we will be able to guide you. Our relocation-style advice will help to make the right choices for you and your family including state and public school accessibility, further education institutions, transport links, leisure facilities, recreational pursuits and much, much more. 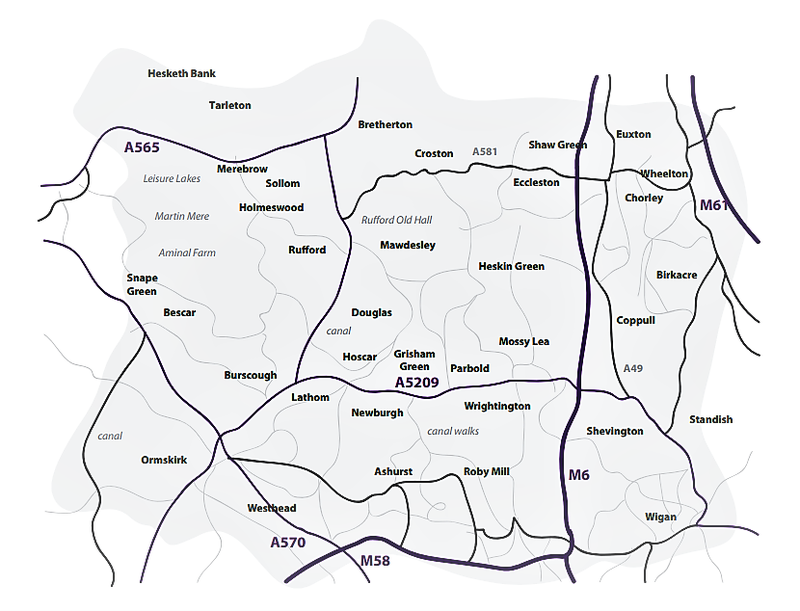 AREAS WE COVER: Adlington, Appley Bridge, Angleszarke, Aughton, Banks, Becconsall, Bickerstaffe, Bispham Green, Blackrod, Bretherton, Brinscall, Brindle, Buckshaw Village, Burscough, Charnock Richard, Chorley, Churchtown, Coppull, Croston, Dalton, Eccleston, Euxton, Great Knowley, Haigh, Halsall, Heapey, Heath Charnock, Hesketh Bank, Heskin, Hilldale, Holmeswood, Lathom, Leyland, Longton, Mawdesley, Mere Brow, Much Hoole, Newburgh, Ormskirk, Orrell, Parbold, Rivington, Roby Mill, Rufford, Scarisbrick, Shevington, Standish, Tarleton, Ulnes Walton, Up Holland, Westhead, Wheelton, White Coppice, Withnell, Wrightington.